A Quality Assessment Point (QAP) is any point in an enterprise network where an MCS Access Series quality measurement device has been deployed. Quality measurement identifies all the packet level events that threaten user experience, such as retransmissions, lost or late packets, fragmented packets. A Quality test is a deep test, which provides about 20-30 extra metrics. The Visualware MyConnection Server (MCS) solution supports a family of Access Series devices ranging from small portable devices that can be used by off-site engineers to provide client measurement services, up to larger models that deliver both client and server measurement services. Including the MCS Access Cloud Server (ACS) 1U data center rack mount appliance. 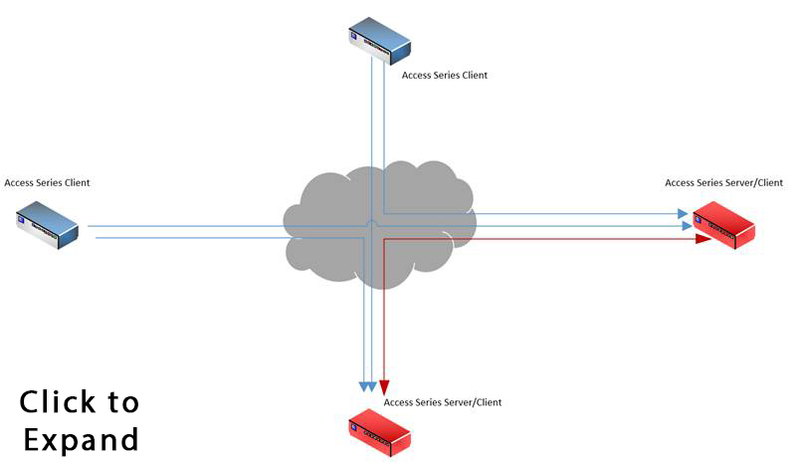 What is unique about the Access Series solution is that it has been designed and built from the ground up. This approach was taken by Visualware to allow MCS to measure a connection for quality and performance at the same time. For example, it is not the fault of the road that a car journey is slow and a bad experience results, if the car had a puncture. A puncture can occur when a road has little or no traffic. QAP satellites can measure the quality and performance of any network segment between two QAPs as long as one end of the segment has a Server/Client QAP. The 'client only' QAP satellites cannot test to each other, however the client/server appliances are specifically designed to accomplish this (as shown by the red arrow in the image to the right) and any QAP satellite can test to one or more QAP satellites, This QAP satellite architecture allows MyConnection Server to QAP satellites to establish a full testing/measurement 'mesh' across any large scale enterprise or cloud network. QAP satellites can support automated testing over any period of time. This ability provides a comprehensive solution for robust assessment testing prior to application deployments in the field. QAP satellite clients and QAP satellite client/servers. Many models of QAP satellites support a multiple core architecture. Multi-core Satellite models deliver two or more independent testing ports which provide load balancing, high scale testing, redundancy, fail-over and simultaneous secure public/private network connectivity. The data center 1U rack mount server supports 2, 4 and 6 ports per mounted server. Multiple ACS servers can be established at a data center if more than 6 ports are needed. All multi-core ports can be synchronized to deliver a test measurement framework that is able to measure both bandwidth and efficiency of connections that are 10Gbps or more. Portable dual core/port devices deliver a convenient solution for off-site engineers while also providing a more thorough framework for CPE testing and RFC2544 testing. MCS allows the client and the server of each core to be separated thus allowing a test to validate any CPE device such as a router, switch or firewall. This design delivers a solution focused on quickly identifying a router/switch/firewall that is the cause of a quality issue. Satellite client/servers edge points in the network establish a QAP Satellite. Deploying multiple QAP satellites throughout a network therefore delivers flexible and powerful framework for quickly assessing and isolating problems across a network to ensure problems do not affect the customer. The client/server QAP satellite was designed specifically to support a low cost, quick deployment, ‘mesh’ model to accommodate large scale networks. 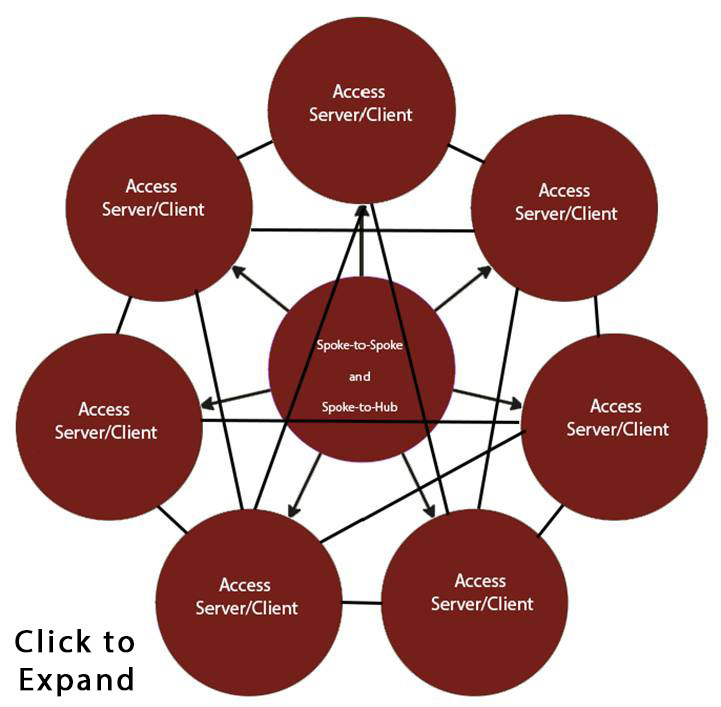 This is often referred to as a spoke-to-spoke and spoke to hub model, as shown in the image to the right. Access Series QAP satellites are designed to deliver a low cost, highly secure deployment model by design. Access Series QAP satellites have no operating system or file-system, this delivers a platform that eliminates both the threats and costs attached to establishing a robust secure environment, especially when QAPs need to reside in the public domain or even on customer premises. The absence of a commercial OS also eliminates the high costs associated with deployment, configuration and the investment in skill sets for ongoing support and maintenance. QAP satellites are designed to be managed centrally from the MCS server. This model allows a large scale to be managed effectively and securely at a low cost. One click of the mouse can initiate or terminate a test suite at hundreds if many thousands of QAP satellites.